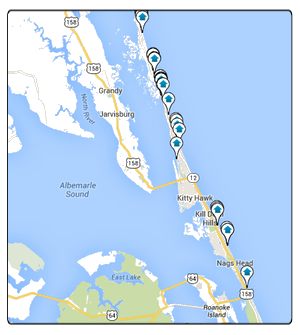 One of the largest Outer Banks communities, Colington and Colington Harbour is a boaters paradise! There are 2 two main islands in Colington, Big Colington Island and Little Colington Island. Big Colington Island is where you will find Colington Harbour, one of the nicest harbors on the East Coast because of its miles of deep canals. The homes for sale in Colington Harbour start at the low to mid $100k’s and go all the way to luxury 5 bedroom waterfront homes reaching upwards of $2 million. If you find a home for sale in Colington you would like to view, please contact us today! Listing courtesy of Debra L. Moore, Broker.